I love tapas food. I always eat too much but I love the concept of sharing and of being able to try new foods without having to opt for them as your whole meal. 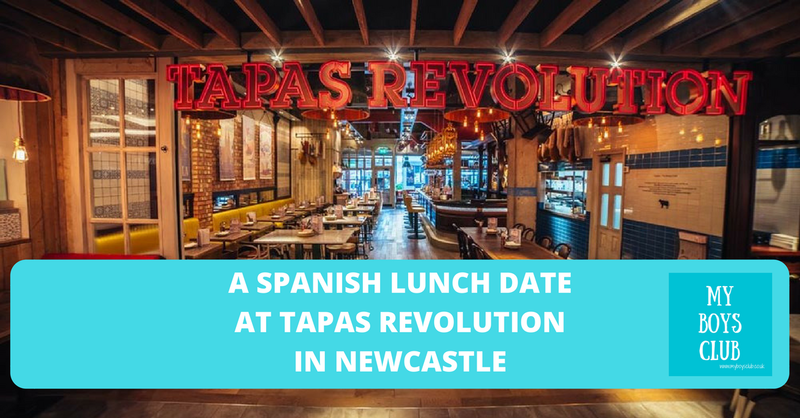 So when we were invited along to Tapas Revolution in Newcastle to sample their Tapas menu we were eager to attend, so hubby and I booked ourselves a table one lunchtime for a lunch date while the boys were at school. This post also contains Amazon affiliate links. 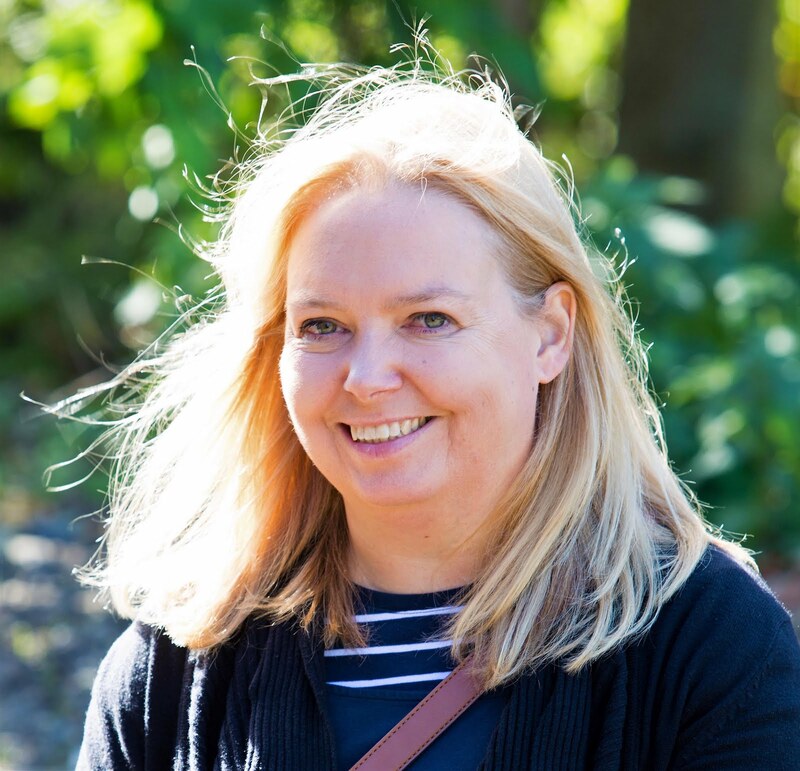 It costs you nothing however if you do buy something after clicking the link then Amazon will pay me a small amount in commission - so thank you in advance if you do! I do have my tapas favourites and I always have to order Patatas Bravas. But I always want to try something new too. You can never be totally sure of what is going to arrive either. I remember being on holiday once in Tossa de Mar on the Costa Brava in Catalonia, where we ordered Pan Con Tomate also known as Pa Amb Tomàquet in a small Spanish bar. It arrived and literally was a couple of slices of toasted bread, a clove of garlic and a tomato. Honestly, those three items placed separately on a plate. Well, we did the only things that came to mind and made our own garlic and tomato bread utilising the olive oil and salt that was on the table. A do it yourself starter. Even if it was DIY it was really good and remains one of my favourite Tapas. Thankfully after googling it years later, it seems we did the right thing, but I love not ever being that sure of whatever is going to arrive. And yes we did order it on our lunch date too. I'm pleased to say on this occasion it arrived on our table fully prepared. So back to Newcastle, and our Tapas lunch. Tapas Revolution opened just under a year ago and launched a Tapas Bar right next to the restaurant in December. 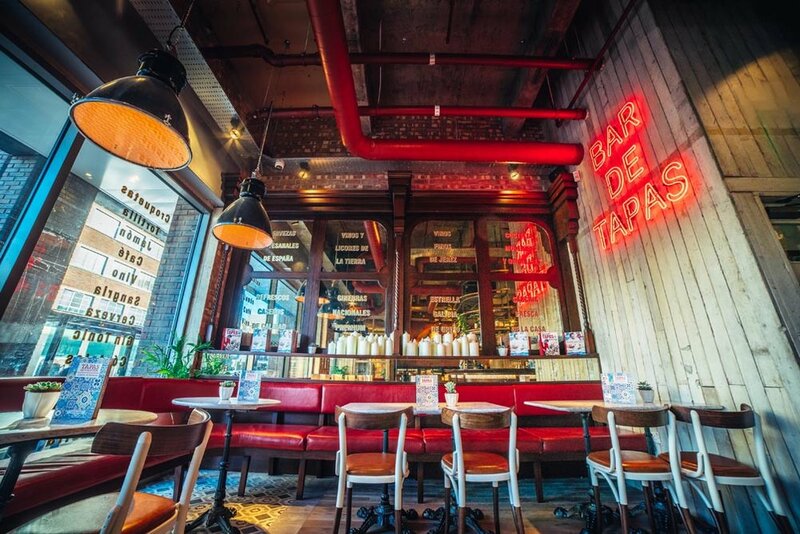 Bar De Tapas, the lounge & sangria bar, entrance is on Blackett Street, opposite Old Eldon Square. It takes its inspiration from the lively, dynamic bars in founder and chef Omar Allibhoy’s hometown Madrid, a city that has more bars per capita than any other city in Europe. And I always thought Newcastle had a lot of bars. Must visit Madrid! On the menu, there is also a wide selection of wine, beer and their own Spanish inspired cocktails. Taking advantage of the 2-4-1 cocktail offer which runs Sunday to Friday between 12 noon and 7pm we both tried the Veterano Julep, on the recommendation of our server. It’s wild strawberry and pomegranate mixed with Veterano brandy, vanilla, mint and lemon. And usually costs £8. I’m not really a brandy fan but this definitely won me over. The full drinks menu can be viewed here. We actually sat in the restaurant Tapas Revolution itself for our lunch date. 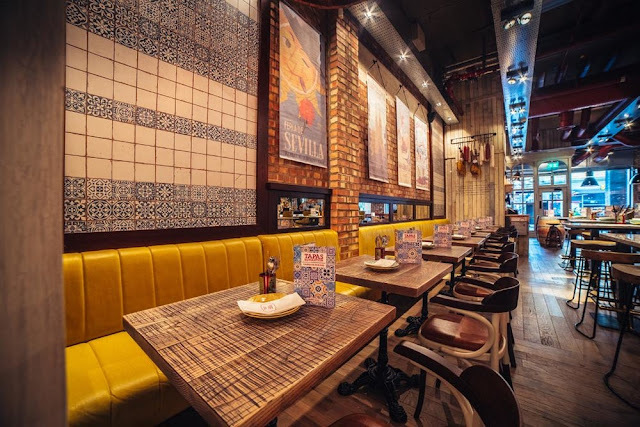 Located in the Greys Quarter of intu Eldon Square, the newly developed part with a wealth of restaurants with an entrance next to Grey’s Monument. 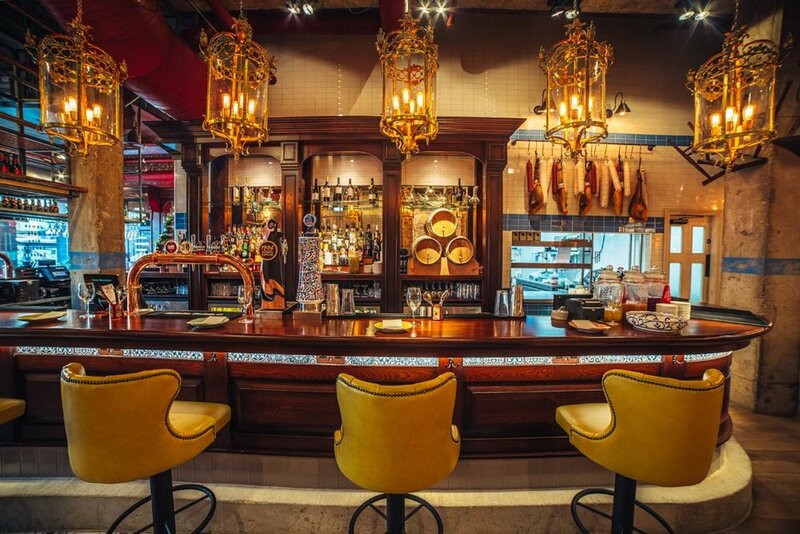 They specialise in Tapas, the famous small dishes found in every bar in Spain and have a variety of meat, fish and vegetarian Tapas on offer. We were sat just outside on the Eldon Square side of the restaurant but although it's in a busy Shopping Mall you don't feel that you are sat in amongst shoppers. It looks very Spanish with its decor and I love the lights that were above us plus some of the quirkier fittings in the restaurant. A lunch menu is available for just £9.95 which includes two tapas plus Pan Con Alioli. There are also set menus and the main Tapas menu which we ordered from on this occasion. The menu suggests 3- 4 tapas dishes per person is a good amount so we decided to share a starter and six tapas dishes. All of the dishes we chose were really tasty and delicious. My favourite surprised me as it the Berenjenas Fritas (crispy fried aubergine). This is a really good way to eat aubergine and highly recommended. One word of warning, do check carefully the dishes that arrive. We ordered the Huevos con Champiñones y Trufa, marked on the menu as (v), but after tasting it my hubby realised it was the meat version Huevos Rotos with chorizo. The dish was changed immediately but it is good to check what you've ordered and had served to you, especially when you are not that sure what it should look like. I really was nearly too full for dessert, however, they sounded so good I wanted to try them and what would this review be if we didn't try the full menu. Churros con chocolate - £4.50 Spanish crispy doughnuts tossed in cinnamon sugar and served with hot dipping chocolate. I just wish I’d been less full to be able to eat all of the desserts but the doughnuts and brownie were both delicious. I’d struggle to pick a winner between the two. Omar’s philosophy is simple: you can cook without fuss and still eat like a king. 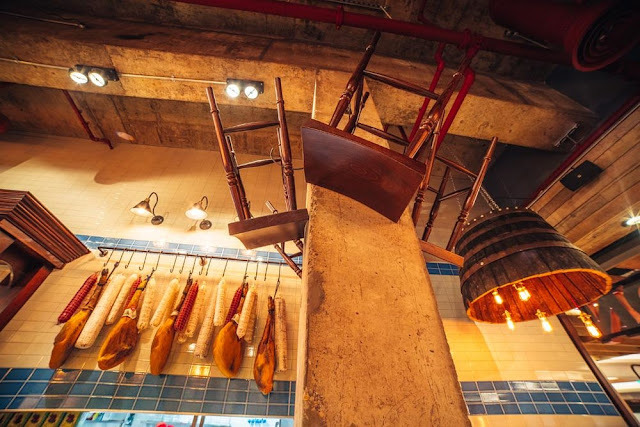 Born in Madrid and trained by the legendary Ferran Adria of El Bulli, Omar arrived in the UK in 2008 to take over the reins at El Pirata Detapas in West London, quickly establishing it as one of London’s best tapas restaurants and winning rave reviews. In 2010 he opened his first Tapas Revolution at Westfield Shepherd’s Bush. 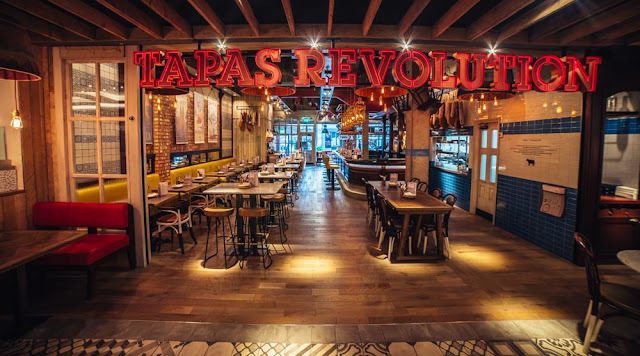 Now there are 7 Tapas Revolution Bars & Restaurants in the UK with sites in Shoreditch, London; Bluewater, Kent; Grand Central, Birmingham; Meadowhall, Sheffield; Eldon Square, Newcastle; Bath, Southgate. Spanish chef Omar Allibhoy has also published hugely successful cookbooks. The first, also called Tapas Revolution, became the fastest-selling Spanish cookbook of 2013. In 2016, he released his second book Spanish Made Simple, a best-seller for consecutive weeks on Amazon. Both books are also available to buy from Amazon (Please note these are affiliate links). A revolution is happening in kitchens across the UK: a new regime of easy, fast Spanish food. Tapas with minimum fuss, maximum flavour. 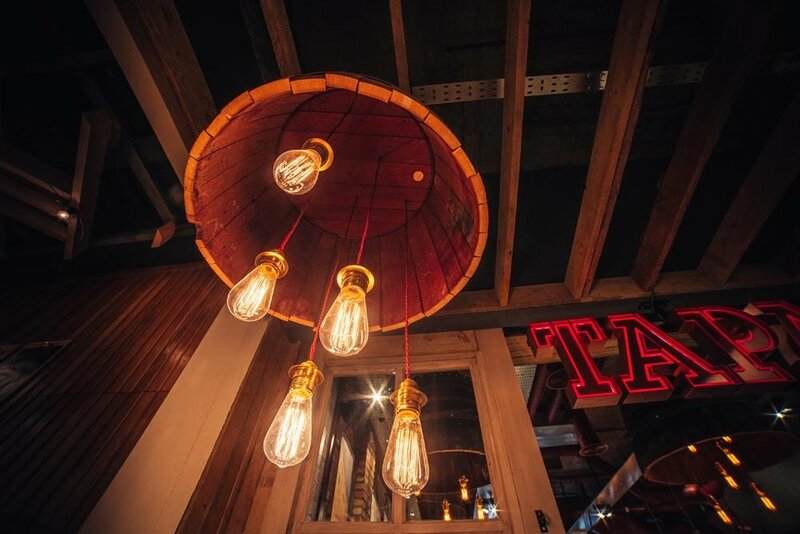 The Tapas Revolution showcases just how simple this can be! Spanish food is no longer the preserve of summer holidays, as Omar Allibhoy’s Spanish Made Simple makes it incredibly easy to create authentic Spanish flavours at home. There are also recipes on the Tapas Revolution website too. So did we eat like Kings? Yes, the food was delicious, rich in flavour, really tasty and the customer service really good too. We discovered our server hadn’t known we were there for a review – which makes the experience we received even better. Our three-course meal with drinks worked out at approximately £32 per head. It’s not cheap but also not too expensive. A lighter lunch is available, and the food was totally delicious. 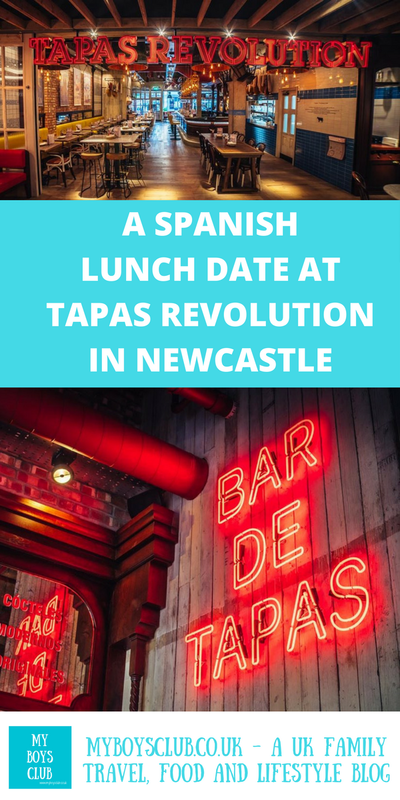 My hubby is a big fan of Tapas, as am I, and he said it was the best Tapas food he’d ever eaten in Newcastle, and despite the mix up over dishes, we’d happily dine out there again. I love that on the menu Tapas Revolution apologises for not being able to bring the sunshine only delicious Tapas from Spain. After sharing their food with us they are totally forgiven for not bringing the sunshine too. What is your favourite Tapas? Disclosure: We received a complimentary lunch for two people in return for an honest review. 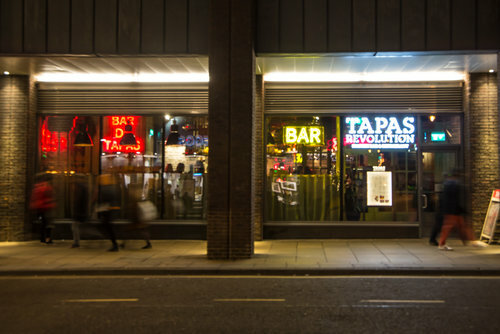 Some of the venue photography was supplied by Tapas Revolution. All food and drink photography is our own.